Frosted gilt movement jeweled to the hammers with bimetallic compensation balance, two hammers striking on two gongs, white enamel dial with subsidiary constant seconds, day, month and moonphase apertures, date dial, outer fifth second timing scale and gilt hands, polished case with diamond-set monogram surmounted by a crown, with hinged covers and cuvette, repeat plunge and chronograph pusher in the band, cuvette and movement signed. By descent to the current owner. 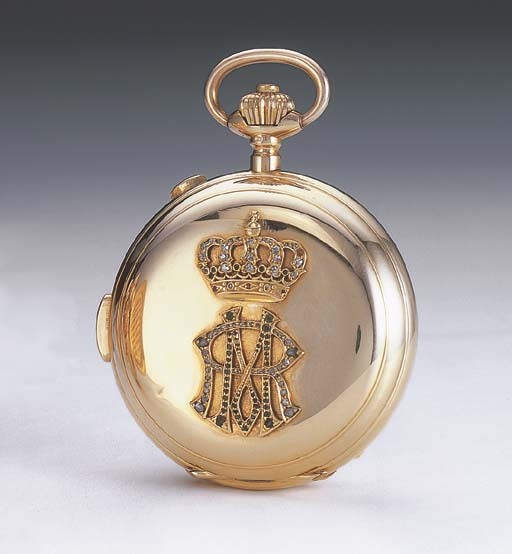 This watch was presented to the German theatre director Max Richards by Kaiser Wilhelm II of Germany. The watch is mentioned in the book Stunden des Phantasten, on page 95 where it is used as a satirical tool by the narrator ""Ah!" Richards activated the repetition mechanism of his watch to show his annoyance in a very condescending manner. "Is this the Chronometer you are playing with, the one that is famous in Halle? What was the reason again, why did the Kaiser give it to you? Ah yes, well, you took part in one of the Nordlandfahrt arranged by his Majesty. And you were the Court Gester or what was it...".